I must confess to a few nerves prior to picking up the phone to call the Baroness (which is very unlike me - and I've interviewed a range of people, from All Blacks and former Prime Ministers, to Super Bowl winning former NFL stars to top businesspeople, to authors who've sold tens of millions of novels), but she was an absolute delight to interview - polite yet opinionated, open and honest, incredibly intelligent, 'sharp as a tack' and not afraid to talk about all sorts of issues. It was an hour full of insights and anecdotes - an absolute goldmine for any interviewer, with the only disappointment being that there was way too much 'good stuff' to fit in the 1200wd feature I was writing for the September issue of Good Reading magazine. 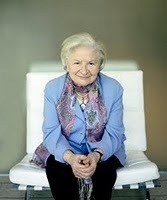 You can also read the 9mm part of my interview with PD James here. I will still try to share some more of the Baroness's other insights and comments at some point, but in the meantime I thought I'd direct your attention to a lengthy and very good feature article by Jan Moir in the Mail Online from this week, where PD James talks about her future writing plans, her thoughts on many social and other issues, and much more. It's interesting stuff. You can read Moir's article, "Both barrels from the Baroness: PD James rails against overpaid BBC bosses and at 90 accepts that she may have written her last novel", here. Thanks for publishing the link. I enjoyed reading it as well as reading your interview, or the part that was published. I hope you get the chance to publish the rest of the interview. Um, Craig - that header, "No ordinary granny"? Please - PD James is a serious-minded, highly productive, much-lauded writer. I'm sure you didn't mean to come off as so condescending, but it just doesn't look good. Oh, and I interviewed her for the Listener http://www.listener.co.nz/issue/3637/artsbooks/14768/logic_not_horror.html last year, and I'm pretty sure I can't have been the first NZ journo to do so, either. Ah Plain Jane, I think you'll find Craig said he was the only NZ journalist who interviewed her in 'the lead-up to her 90th birthday'. I don't think he says he's the only NZ journalist ever to have spoken to her. As for your other comment about his title, you may have a point there. I think it comes down to this - would PD James have a problem with it? If so, then yes, you're right. I imagine she's okay with it though. I don't think the title is condescending at all Jane - it's more playful, with a bit of a sly smirk, like Baroness James herself (at least that's the way she came across to me this year). I'm pretty sure most people reading this blog are well aware of Baroness James's many outstanding achievements (I've outlined many in the past myself), so I don't think there will be much confusion or thought that I'm somehow belittling her with the title. It's just a statement of fact - she's a grandmother, and she's not ordinary (in fact, she's very extraordinary - as you and I both know, having had the good fortune to interview her). Thanks very much for the link to your article by the way. I enjoy reading the books articles in The Listener. As Anonymous said, you may have overlooked my comment about being the only NZ journalist to interview her in the lead-up to her 90th birthday (ie this year) - perhaps I should have more clearly stated that I meant this year. I certainly never said or thought I was the only Kiwi journo to ever speak to her. In fact I remember reading your article last year (which is why I didn't offer Guy a piece on PD James from my recent interview, since she'd recently been covered in The Listener).